Glocks are boring. I’m not saying they’re “boringly reliable.” They’re just boring. Black, blocky and blah. They are also the majority of the law enforcement/self-defense market because they work exceptionally well. Some of the best pistols in the family collection are Glocks which will never be surrendered by trade or sale. My Gen 3 M20, for example, is a trusted companion on long hikes. 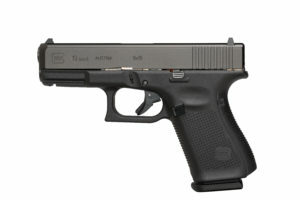 A few weeks ago, Glock released their 5th Generation pistols to the public. Being neither a fan nor a hater of the brand, here is a review a Glock 19 Generation 5. There’s no reason to waste anyone’s time with the weight, barrel length, etc. on a Glock 19. Let’s just skip that part. Despite their popularity, some folks have reservations about Glocks to this point. The most common concerns voiced about Glocks are stocks (grip), magazine well and slide stop. Glock addressed those issues and more with this latest iteration. Glock made over twenty design modifications in its 5th Generation pistols, but the top five are finish, barrel, grip, magazine well and slide stop. The Gen 5 Glocks sport the new nDLC finish. I don’t know what that means. I’m not sure there was anything wrong with the old finish, but this one is reported to thwart rust and scratches better. It’ll be a while before I can give this feature an honest test, but I’ve never minded my Glocks showing hard work in the form of the occasional exterior ding. A big change in the Gen 5 series is the addition of the Glock Marksman Barrel. The rifling and crown have been modified to improve accuracy. I never thought there was a problem with Glock accuracy, considering their intended purpose. Still, more is better. 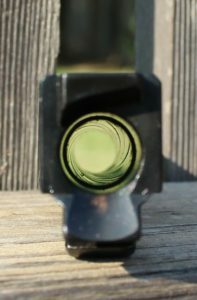 If the reader wants to delve deeper into the transition from polygonal to a more traditional barrel rifling, he or she will have to read articles from smarter folks. Considering the most common uses of defensive pistols, this seems like small stuff. One of the big problems many shooters, including this one, have had with the Glock pistol in general is the slick grips. The finger grooves of the Generation 3 models were not an improvement for many of us. The Generation 5 pistols have not only a grooveless grip, but a reverse stippling which greatly aids in purchase. This is a big improvement to me. I can grip this pistol like none of my other Glocks. Another complaint I hear about Glocks in general is the magazine well. Personally, I have always had difficulty during reloading drills with them. This Gen 5 G19 is much better in that regard, but still not quite as good as one might hope. The sides of the magazine well are flared, but the front/rear are still pretty abrupt. Some shooters index the side of the magazine well for their reloads and some use the rear. I’m in the latter group. Those in the former will love this improvement. It’s fairly certain that experienced, wrong-handed folks (I kid) have figured out how to manipulate the slide stop before now. Still, we see novice lefties struggle with locking the slide on Glocks. There will be no excuse with the Gen 5’s with its mirrored lever. Despite the craptastic plastic factory sights (which Glock knows any serious shooter will replace anyway), I was able to muster a 2.87” five-shot group with Federal 124 grain HST +P at 25 yards. 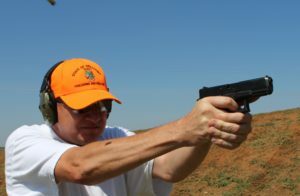 The worst group of the day was 3.24”, which still isn’t bad for a mediocre shooter on a hot, windy Oklahoma afternoon. Both were shot from the prone position without benefit of a mechanical rest. The groups all patterned about two inches above my point of aim. A few of us shot a 50-round box of the HST plus about 200 rounds of mixed FMJ’s and old defensive ammunition including Remington Golden Sabre 124 grain +p and Corbon 100 grain Pow’r Ball. The pistol functioned perfectly. Glock fan boys (and girls) and haters are equally unwise in my eyes. There is no such thing as “perfection.” Gear doesn’t love you back, so you had better be certain your emergency equipment actually functions as it should and that you are proficient in its use no matter how enamored you are with a particular brand. On the other side, shunning the most well-tested, critiqued and mainstream pistol platforms in the world is myopic. The 5th Generation seems to be quite an improvement to me. Skepticism is necessary in product reviews but today, I am holster shopping.